Cholesterol produced by the liver and necessary for the implementation of biological processes. However, excessive amounts of cholesterol in the body can lead to serious diseases. Cholesterol is a substance related to lipids. 80% of cholesterol the liver produces and the remaining 20% appear in the human body in the result of the digestion of food. It is the main building material for all body cells. Also thanks to the cholesterol produced by bile acids. In translation from Greek language into Russian cholesterol means "solid bile". This name he received due to the fact that the first cells were found in the examination result in the gall stone. With the increased level of cholesterol lipids move through the body, forming plaque on artery walls. When plaque develops for a long period of time, they become fibrous and contain a lot of calcium. This causes narrowing of the arteries due to which blood flows poorly to the heart. Also at high cholesterol there is a high probability of thrombus formation. A thrombus is poorly attached to the walls of the vessel and can end at any moment, triggering a heart attack. With increasing content of cholesterol in the blood there is pain in the chest called angina. In addition to this, you may develop the syndrome of Charcot, in which there is severe pain in the legs when walking. Also at an elevated level of cholesterol can appear subcutaneous fat pink. Most often they are formed on the eyelids or in the area of tendons on the Shin. Fish oil is an effective folk remedy for fighting various diseases, and most importantly - affordable. He maintains an optimal level of cholesterol in the human body due to its content of omega-3 fatty acids. Omega-3 fatty acids protect the body from inflammation, prevent blood clots and reduce triglyceride levels. They are part of the cell membrane and affect the function of receptor cells. These acids normalize the amount of cholesterol. They can be found in fatty fish such as salmon, tuna, cod, mackerel, halibut, trout and sardines. 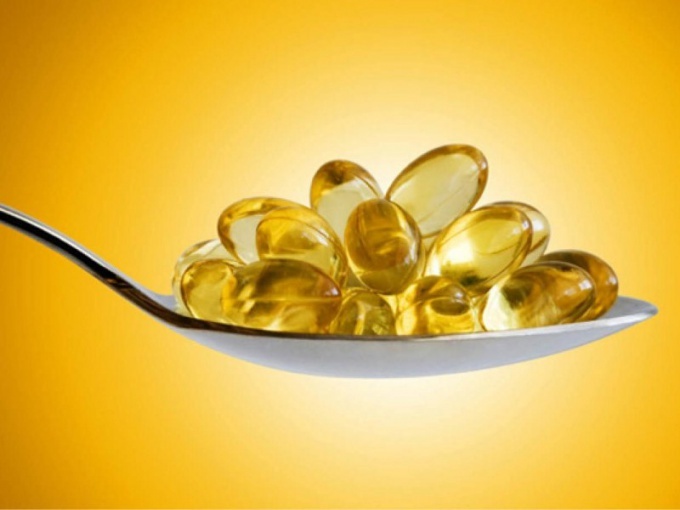 Also fish oil can be purchased at the pharmacy, in the form of rounded capsules yellow color. They have no smell and taste, so discomfort in their admission does not arise. Medical studies have shown that food derived from omega-3 fatty acids are absorbed much better than those ingested in supplements. In addition, fish boiled in acid content is much higher than in smoked or roasted. And the most useful content of omega-3 fatty acids is salmon. Cardiologists advise their patients to take fish oil for the prevention of cardiovascular diseases, as well as a sure cure for ischemia and metabolic disorders.